﻿ Kick´ em jenny uderwater volcano between Grenada and Carriacou. Kick´ em jenny uderwater volcano between Grenada and Carriacou. Between Grenada and Carriacou is an active underwater volcano called Kick' em Jenny. Vessels must stay clear of this zone, gas eruptions cause danger. Guides » Kick em Jenny. Kick ’em Jenny underwater volcano near Grenada. Kick ’em Jenny is a submarine volcano located 8km north of Grenada. The volcano is about 1300m high, and its summit is currently thought to be about 180m below the surface of the sea. In addition to the vulnerability of the shipping industry many people are also concerned about sea waves or tsunamis. While it is probable that large explosions or landslides at Kick ’em Jenny could generate tsunamis, the threat from tsunamis has been largely over exaggerated. Not all eruptions at Kick ’em Jenny will generate tsunamis and not all tsunamis will be large. 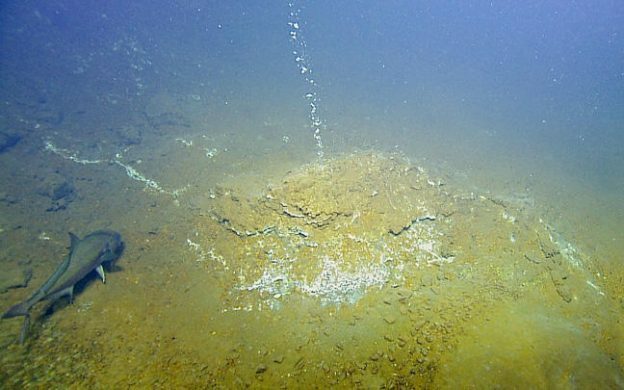 As far as we know, Kick ’em Jenny is the only ‘live’ (likely to erupt again) submarine volcano in the Eastern Caribbean. It is also the most frequently active volcano in the region, erupting at least 12 times since it was discovered in 1939. The last eruption of Kick ’em Jenny occurred in December 2001. The volcano is currently at Alert Level YELLOW and there is 1.5km exclusion zone around the volcano. Kick ’em Jenny is also a modern day demonstration of how the volcanic islands in this region were formed. With each submarine eruption deposits of volcanic material accumulate around the summit. All of the volcanic islands of the Lesser Antilles began as submarine volcanoes. As an example from the northern hemisphere, Surtsey Island in Iceland formed in 1963 when a submarine volcano reached the surface of the sea. Eventually, Kick ’em Jenny will form a new island in the southern Grenadines. How deep is Kick ’em Jenny? Between the 1960’s and the late 1970’s the depth to the summit of the volcano was approximately 180-190m. In the 1970’s and early 1980’s the depth to the summit of the volcano decreased to approximately 150m, reflecting the growth of a dome within the crater. This dome was destroyed during eruptions in the late 1980’s and a survey conducted by the U.S.-based National Oceanic and Atmospheric Administration (NOAA) in March, 2002 revealed that the summit is currently 180m below the surface of the sea. Kick ’em Jenny is the source of a number of potential dangers. Until recently it was thought that Kick ’em Jenny had grown 46m (from 236m to 190m below sea level) between the surveys of 1962 and 1966. However, data collected from the two most recent cruises (March 2002 and March 2003) and a careful re-examination of data collected on even earlier cruises make it clear that the crater rim of Kick ’em Jenny has remained at the same depth below the surface (180-190m, within measurement uncertainty) since at least 1966. The major sequence of changes over the past forty years has been that a dome grew in the crater between 1976 and 1978. This dome collapsed in either 1988 or 1990 and there is now no trace of it left. There is in fact a new interior crater about 30 metres deep on the site where the dome used to be so it is more accurate to say that the active vent area of Kick ’em Jenny has in fact become deeper. Kick ’em Jenny has, therefore, NOT grown closer to the surface between 1962-2003. During a research cruise in March 2003 scientists discovered three craters (C1, C2 and Kick ’em Jack) and two domes (D1 and D2) near Kick ’em Jenny. Further investigations are needed to confirm whether these are separate ‘live’ volcanoes. Click on the image for a larger view. Underwater volcano Kick em Jenny. Where is Kick ’em Jenny? Kick ’em Jenny is located approximately 8km north of Grenada (12.18 degrees North, 61.38 degrees West). This location is in the southern part of the Grenadine Islands which are themselves in the southern part of the Lesser Antilles island arc (see Map 1 below). The volcano should not be confused with the nearby Diamond Rock, which is also called ‘Kick ’em Jenny’ on some charts. On land the location is clearly visible from northern Grenada. From Sauteurs look towards the Île de Ronde. West – i.e. to the left – of the Île de Ronde is a small group of rocks called The Sisters. Kick ’em Jenny is 1.6 nautical miles (about 3 km) due west of the Sisters or about as far west of the Sisters as the Sisters are of the Île de Ronde. The depth from the highest point of the crater rim to the lowest point of the crater floor is about 80m. The crater is breached to the northeast and contains an interior crater about 30m deep. The summit sits within a much bigger horseshoe-shaped depression which extends at least 20km to the west of Kick ’em Jenny and widens from about 5km to 10km. The depression contains a sequence of debris-flow deposits. For persons planning to take sea vessels in the vicinity of Kick ’em Jenny. The two most critical hazards regarding Kick ’em Jenny are the potential threats to shipping and the hazards posed by tsunamis. Currently, the threat to the shipping industry is the more immediate concern. Although the most obvious hazards are those directly resulting from an eruption, the volcano may also be dangerous to shipping during ‘quiet’ periods. During an eruption, water near the volcano may become rough and the rapid ejection of hot rocks and ash can damage ships nearby. However, during quiet periods between obvious eruptions, it is extremely likely that considerable amounts of volcanic gas escapes from Kick ’em Jenny. If these bubbles become concentrated and the water density drops, any boat entering into the area will experience a loss of bouyancy and may even sink. This possibility of lowered water density above the volcano is an ever-present hidden hazard. For this reason scientists at the Seismic Research Unit, in collaboration with the government of Grenada, have instituted a 1.5km exclusion zone around the summit of the volcano. Exclusion Zones at Kick ’em Jenny. The volcano is located at 12.18 degrees North and 61.38 degrees West. The first exclusion zone (1.5km) is always in effect. The second exclusion zone is usually enforced during an eruption (5km). Source: University of the West Indies, St. Augustine, Trinidad & Tobago, West Indies. Previous: Tourguides for Carriacou and the Grenadines. Next: National parks on Grenada and hiking excursions.